In combination with computer-aided design and advances in materials science, additive manufacturing can now produce more complex objects and products beyond prototypes and toys. 3D-printed vehicles attracted a lot of attention at last summer’s International Manufacturing Technology Show (IMTS) in Chicago, and numerous vendors exhibited in the 3D Printing Marketplace at last month’s Consumer Electronics Show (CES) in Las Vegas. As recent trade shows demonstrate, 3D printing is continuing to mature and get faster, allowing for more use in production. The U.S. government and industry leaders such as 3D Systems and Stratasys are working to develop hardware and software to increase additive manufacturing flexibility. After a period of adjustment, 3D printing companies are finding investment and profit by focusing on commercial applications over consumer ones. The Oak Ridge National Laboratory (ORNL) and its partners produced both the sports car and Jeep seen at the Chicago event. The Shelby Cobra was printed at U.S. Department of Energy’s Manufacturing Demonstration Facility at ORNL using the Big Area Additive Manufacturing (BAAM) machine. The national lab and Cincinnati Inc. jointly developed the BAAM system, which can manufacture strong, lightweight composite parts without the need for tooling. It was designed to be 500 to 1,000 times faster than existing industrial 3D printers. BAAM is also capable of printing polymer components in sizes greater than one cubic meter — 10 times larger than conventional industrial 3D printers. The printed car incorporated “plug and play” components such as new engine, battery, and fuel-cell technologies. It also included hybrid system designs and power electronics and wireless charging systems, which allowed researchers to easily and quickly test new ideas in a driving lab. The Jeep was a 3D-printed model of a 1952 Willys M38 Jeep. Using the original vehicle, ORNL researchers were able to print directly from a CAD model. Like the Shelby Cobra, the Jeep was printed on a BAAM machine. The additive manufacturing system used composite pellets made of 80 percent ABS plastic and 20 percent carbon fiber. This vehicle was printed directly from a CAD model of the 1952 Willys M38. The Jeep’s gear shift knob was printed on an Arcam unit using titanium powder. Once the printing was finished, partner Tru Design finished vehicle body with a proprietary coating system leaving it with a shiny, automotive finish. The print system featured direct design to print, which enables flexibility/power in design by removing constraints of traditional design methods. The military was interested in the 3D-printed Jeep because finding parts for these vehicles is becoming increasingly difficult, said William H. Peter, director of the advanced manufacturing office at ORNL. He added that compared with the 3D-printed vehicle displayed at the 2014 IMTS event, the vehicles displayed last year had much smoother finishes. The BAMM system allowed the Jeep and Cobra to be printed much faster than was possible a couple of years ago. However, the vehicles were still in the concept stages. The 3D-printed parts had only gone through minimal testing, not the rigorous testing for vehicles that would actually be used on the road, Peter said. It will be some time before such a vehicle could be ready for actual use, he added. One of the biggest developments in additive manufacturing is the incorporation of data analytics, according to Peter. By using sensors to provide feedback as parts or products are printed, a company can quickly adjust to correct any errors, he said. Also at IMTS, 3D Systems Corp. showed its latest advancements to its Figure 4 technology, the company’s modular stereolithography (SLA) system designed for factory production of plastic parts. The SLA system offers print speeds of up to 50 times faster than conventional systems, as well as the ability to integrate with secondary processes such as finishing and coating. The Figure 4’s productivity and flexibility makes it a viable digital alternative to injection molding, claimed 3D Systems executives. 3D Systems has also expanded Figure 4’s capabilities to incorporate automatic, inline 3D inspection of parts for closed-loop manufacturing. Simultaneous to parts inspection and measurement, the system is designed to generate a real time, detailed report with go/no-go feedback. This process provides users with immediate confidence in parts compliance while enabling highly diversified production, the company said. The automated system can do most of the process itself, without the need for human intervention. 3D Systems is looking for partners to help it bring Figure 4 to the market. The company also announced its strategy and updated management team to help its customers transition from prototyping to production. Stratasys Ltd.’s Infinite-Build 3D Demonstrator is designed to build parts of unlimited length at 10 times the speed of other 3D printers while maintaining production quality, accuracy, and repeatability. The Stratasys Robotic Composite 3D Demonstrator integrates the company’s core additive manufacturing technologies with industrial motion-control hardware. It also works with Siemens AG’s design-to-3D printing software capabilities. Stratasys also offers the Fortus 900mc Production 3D Printer, which is aimed at helping users get a head start in creating custom tools on demand. 3D printed custom manufacturing tools, like jigs and fixtures, is one example of how additive manufacturing is being used to augment conventional production environments. Stratasys’ Manufacturing Aids Package offers assistance to manufacturers seeking to create custom manufacturing tools. The materials-and-services package includes 40 hours of design work from Stratasys Professional Services. As with drones and social robots, 3D printing has shifted its focus from the consumer market to the commercial one, where the technology’s price and use cases are less of a barrier. Recent transactions show that money is once again flowing into additive manufacturing. Last November, Asimov Ventures closed its first round of funding, and Tend.ai raised $2 million for software and hardware involved in advanced manufacturing. In addition, New Valence Robotics, a.k.a. MassRobotics neighbor NVBots, has raised more than $2 million for metals printing and manufacturing software. 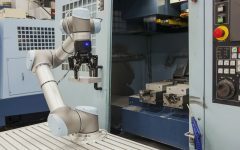 NVBots and Cincinnati Inc. have also released the Small Area Additive Manufacturing (SAAM) system, which is a smaller sibling to BAAM. Last summer, Formlabs Inc. received $25 million in partnership with Autodesk Inc., and Glowforge obtained $22 million in Series B investment to bring its 3D laser printers to full production. Incidentally, Autodesk was among the companies demonstrating faster 3D printing at CES 2017. New commercial applications for additive manufacturing include tools for the oil gas industry, construction of emergency shelters, and even localized factories. Medical applications for the technology include 3D-printed skin and blood vessels. Such innovative uses are often the result of partnerships, which many exhibitors hoped to forge in Las Vegas. Although 3D Systems wasn’t in this year’s marketplace, several other companies exhibited the latest in 3D printing, from 3D pens to metals printing.